Executive Director of the Caribbean Regional Fisheries Mechanism (CRFM), Milton Haughton, was the keynote speaker on Thursday, June 29, at the awards ceremony for outstanding fishers in Belize. The event was organized by the Wildlife Conservation Society along with the CRFM and other NGO partners and the Belize Fisheries Department, as the climax to a month-long observance in celebration of fisherfolk in Belize. The outstanding fishers were LeoBihildo Tamai – Fisher of the Year for 2017, a career fisher of 30 years who lives in Sarteneja Village in Corozal, northern Belize; Dale Fairweather – a deep sea and lobster fisher of southern Belize; and Eleodoro Martinez, Jr., a fisher of Chunux, also located in Corozal. “Fisherfolk and fisheries have always been a very important part of Caribbean culture, social life and economies,” Haughton said. He added that not only do the fisheries produce provide very important sources of food and nutrition; but the sector is also an important source of foreign exchange earnings, employment and livelihood opportunities, particularly for the poor and vulnerable members of society. “But the livelihoods of fishers, the safety of their communities in the coastal areas, and continued enjoyment of the benefits from the seas and oceans are threatened by climate change, sea level rise, and ocean acidification, among many other challenges,” the CRFM Executive Director said. 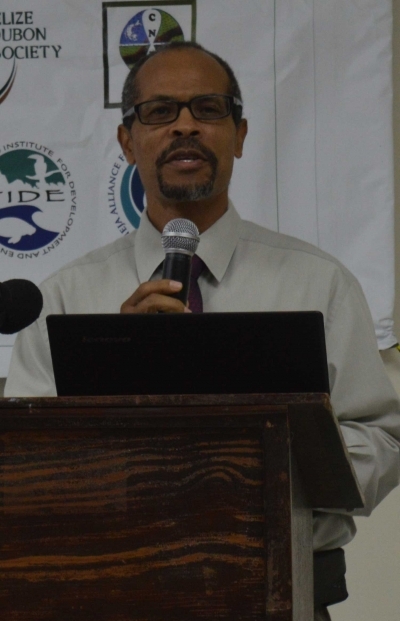 “The future we want in the Caribbean is one where fisheries are sustainable, resilient and productive, and are used in a way that promotes economic growth, food security and health, and the prosperity of our people now and in the future,” he asserted, adding that in order to realize the envisioned future, more importance needs to be given to evidence-based decision-making, in order to improve our understanding of the impacts of climate change. This would, in turn, help the region develop adaptation strategies to protect our communities and natural resources. The region is also grappling with emerging challenges which confront the sector, including the more recent phenomenon of massive quantities of sargassum seaweed in the coastal water. Haughton said that the sargassum seaweed is returning, and reports are that it is already affecting the Eastern Caribbean.